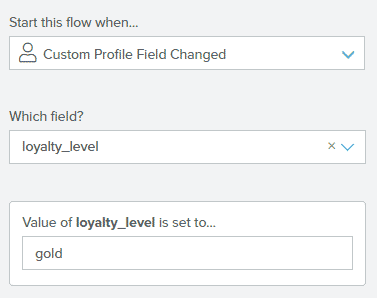 Our latest Lifecycle Optimizer Entry is live in all accounts: Start customers into flows the moment their custom field value is changed. The “Custom Field Change” entry monitors your user’s custom fields in real time. When a field value is changed from a Hosted Page, Preference Center, Lifecycle Optimizer flow or API Call, the customer will begin the flow. Flows begin when the value in the entry matches the value of the update received. Only the first change of the value is recognized, which means a repeat set to the same value will be ignored. Custom Field Change flows begin working the moment you activate them – no nightly jobs to hold you up. They’ll work with all one-off Custom Field updates as mentioned above, and will not work with any bulk updates or jobs. Flows and custom fields are virtually unlimited – we look forward to seeing how you use this powerful new entry.